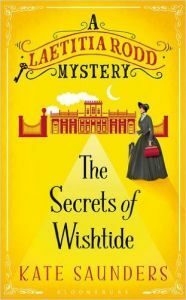 ‘Secrets Of Wishtide’ is the first in a series of ‘Laetitia Rodd Mysteries’ about an intrepid female detective in the cast of Sherlock Holmes (who else?) and its inspired, as the author Kate Saunders tells us, by her own obsession with Charles Dickens’ ‘David Copperfield’ and some throwaway lines therein. The passion and love for the period is evident from the story she has created. I’m always happy to embrace another personification of a consulting detective. Laetitia Rodd is a widow. Her brother is a criminal barrister who gets her to help out with occasional cases. This is most helpful to Mrs Ridd as she is living in genteel poverty and sometimes it’s not so genteel. She has luckily happened upon a landlady with a heart of gold who has embraced her as a friend. Together, Laetitia and Mrs Bentley discuss the cases. Their attitude creates a better quality of life for both of them. Although Laetitia misses her archdeacon husband, she is a very competent widow who makes the best of her situation. Her latest case looks like a simple one of confirming that a young lady will make a suitable and spotless bride for a young man with an inheritance. Sent as ‘governess’ to the lively sisters of the young man, she soon finds things are much more complex and that is before the murder. This tale with hints of Dickens, Conan Doyle and featuring deception, sin and fallen women is a great murder mystery story and all the better for a female heroine with some chutzpah. The historical setting highlights how dependent middle-class women were on the good offices of men. Life without the protection of a husband and father to offer the security of marriage or an inheritance meant women had a precarious existence. Saunders does not judge and neither does our eponymous heroine through whom we learn a lot about kindness and commonsense. I found the ending little disjointed and brusque after the build-up but, overall, it’s a good story and I look forward to more tales about the detective Laetitia Dodd.